As those lucky enough to have visited Antarctica (not me) know, most trips don't go straight to the continent. Stops at a couple of archipelagos along the way are common, especially the Falkland Islands and South Georgia and the South Sandwich Islands. As it happens, it appears that the Street View team also stopped at these islands on their way south, and they've got some images to share. The Falkland Islands are a British Overseas Territory off the coast of Argentina probably most famous to us as the site of a brief armed skirmish in the early 80s. 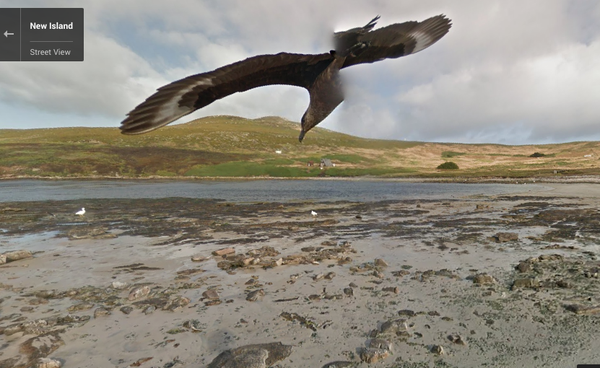 The Google crew joined a trip from Lindblad Expeditions in October 2014 and took Street View shots at nine locations, including two stops in the Falklands: Carcass and New Islands. The expedition stopped at this small island off the coast of West Falkland island and the Google Street View guy did a big lap around. The island is apparently run as a sheep farm, but it's also an Important Bird Area, for reasons that will soon become clear. At the end of this dilapidated pier - if you could pan around you'd see landing boats and lots of people milling around getting ready to hike - are some cormorants. They're Rock Cormorants (aka Rock Shags aka Magellanic Cormorants). But look on the rocks to the left of the pier - see that little guy? - I think that's a Black-crowned Night Heron! Off to a great start! From the beach, the guy hikes up a hill. At the top of this hill something awesome happens. Back in 2008 I emailed a guy named Jonathan Meiburg, a singer and musician for the bands Shearwater and Okkervil River (and solo stuff - I particularly love this version of the Kinks' "Strangers" he guests on with Wye Oak for the AV Club Undercover series), because I'd read somewhere that he was into birds. He responded, and allowed me to interview him about his connection to birds and birding on the road. He was fantastic, and it was a real thrill to talk to someone I respected for this dumb blog. Anyway, in that interview Meiburg talked a lot about his experience helping out British ornithologist Robin Woods on a survey for Striated Caracaras in - where else? - the Falklands. He became enamored with these Caracaras (as did Darwin), and loved birds ever since. Can you guess what was hanging out on top of that hill? The Street View hiker continued on past the Caracaras into what I assume was the major point of interest for the tour group: a huge penguin colony. There are two kinds of penguins found on Carcass - Magellanic (with a white "c" on their face) and Gentoo (with a white dot). And, well, here they are, just as you've always imagined penguins: standing on a big plain of green grass. Right? Look at all those damn penguins! Fear not, our Street View penguin adventures are just getting started. Crossing the island from the penguin colony, the Street View hiker passes a number of white-and-gray geese feeding in the grasses, called Upland Geese. There may have been some of the rarer Ruddy-headed Geese in here too, but they look to me almost exactly like female Uplands and I couldn't tell any apart in GSV. endemic Falkland Steamer Ducks! Hell yes. WHAT?! That little bird, which I completely lucked into and only appears in one Street View frame, is 100% a Cobb's Wren, right where it should be doing just what it should be. This little guy is both the smallest bird I've ever seen in Street View, and the rarest. Fun times. Can't top that, let's move to New Island. South of Carcass Island but still off the west coast of West Falkland is New Island, named by the famous cartographer Joseph Lazyass. It should be called Rad Island. Brown Skuas! That bottom image was snagged by Samuel Jolly of The Birder's Conundrum. Sorry for ruining your life, young man. Look closely at that image again, though, see those white spots on the beach? They're Kelp Geese, and they're all over the island. Lovely birds. Just your standard everyday albatross and penguin colony. No big deal. Those are Black-browed Albatross and Rockhopper Penguins. The little gray albatrosses are chicks. ALL THIS FROM THE COMFORT OF YOUR LIVING ROOM. That concludes the first stop on our tour to Antarctica. Falkland Islands, you set a very high bar. What will we see in our next stop, at the Sandwich Islands? Stay tuned. P.S. Although he didn't take these Antarctic images, a guy named Dan Fredinburg did a lot of GSV's more extreme stuff on tall mountains and at the Great Barrier Reef. Sadly, Dan Fredinburg died in Nepal after the recent massive earthquake and subsequent avalanches that occurred there. Here are a list of approved charities accepting donations to help the relieve effort in Nepal. "Worst blog on the internet"? Not a chance -- it's great, and the Google Street View pieces are my favourite (along with What the State Birds Should Be). I look forward to the next instalment. This is pure genius. Well done, sir. Last year I was in the ornithological expedition. I yes I The Lucky one because I enjoyed incredible views of island South Georgia. Despite the cold climate https://poseidonexpeditions.com/antarctica/falklands-south-georgia-best-southern-ocean/ has organized this tour. And the itinerary was very comfortable and really interesting. I learned a lot of information about the life of the inhabitants and nature northern continent.